World of Warcraft players have been writing various guides for the game since it began, and this constant desire for information keeps all of us wanting more guides about pretty much anything with the game. Many players are already very familiar with the 1-85 leveling guides and profession leveling guides, and now there’s even a new guide for instance leveling. However, one area that some players overlook is the daily quest guide. After all, as soon as you reach level 85, you stop doing quests, right? Actually, many players do stop questing at level 85, but the fact is that there are so many bonuses to be earned through daily quests. For one thing, daily quests provide a reliable source of income for the player who got all the way to level 85 without saving any gold up. Of course you don’t really need a lot of gold before you reach level 85, but you should still make efforts to save it up as you level. However, even the small amount of gold you save as you go won’t be enough to support your level 85 character. You will constantly be looking for gear upgrades, and some of your gear will need to be crafted. You will also need plenty of gold to spend on enchantments and gems to enhance your gear. You won’t believe how much gold you’ll end up spending just to get your toon geared enough to enter Icecrown Citadel, where all the top level gear will drop off of the bosses. Another reason you will need to keep doing daily quests is if you have certain professions. Jewel crafting does require you to complete daily quests in order to earn rare gems and patterns. Also cooking and fishing require daily quests, especially if you want to get the recipes for the fish feast, which is commonly needed for raids. 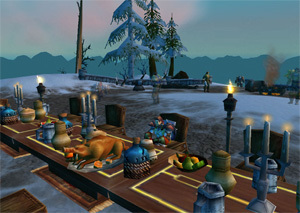 Another common reason for running daily quests is to earn reputation with the various factions on World of Warcraft. Reputation allows you to purchase special designs and recipes for your profession, in addition to enchantments you won’t be able to get anywhere else. There is even a quest chain and set of dailies to earn the right to purchase one of the fastest mounts in the game. Purchasing the Netherdrake requires an exalted status with the Netherwing. Before you begin your daily quest routine, figure out what your character needs the most. If you’re a new level 85, then a great place to begin is with the daily quests in the Storm Peaks. These quests earn you a decent amount of gold, in addition to earning you reputation with the Sons of Hodir, a faction which every class and race can benefit from being exalted with. You’ll want to consult a WoW dailies guides to determine which faction would help you the most if you were exalted with it.